In their first appearance in front of a live audience together since leaving Top Gear, there certainly was anticipation in the air as Jeremy Clarkson, Richard Hammond, and James May were reunited on stage at Belfast’s Odyssey Arena. The three amigos arrived in Belfast on Thursday for a brief press shoot, before returning on Friday night for their first performance. After screening some of their teaser videos we had posted earlier in the week, and a cracking 70s cop show inspired send up film titled Interceptors, explosions and the Eye of the Tiger brought Jezza to the stage in a hovercraft, naturally. When the cheers and pyrotechnics died down, the three presenters seemed to fall comfortably back into banter, on form with what we once knew on TV, and without the shackles of broadcasting certainly with more colourful language and close to the bone quips. Richard Hammond’s “Gentleman Sausage” and a “Bert and Ernie Cake” all uttered in the same breath, with roars of laughter from the Northern Irish crowd. After introductions, Paul Swift and his display team were on hand in a ‘dancing Fiestas’ act which called for some precision driving, although in light of the rest of the event were quite pedestrian in pacing. Certainly a warm up for things to come. Next up was the more typical (am I allowed to say Top Gear style) producer challenge where the presenters had to concoct an electric vehicle using Kitchen equipment. It was as ridiculous as it sounds, and with Clarkson giving Hammond and May grief whilst claiming his creation to be the best that mankind had to offer (including that Stephen Hawking himself could do no better), it was rip-roaringly hilarious. Richard Hammond with his “Gentleman Sausage” at risk from his low slung Ironing Board Racer. And May is the washing. 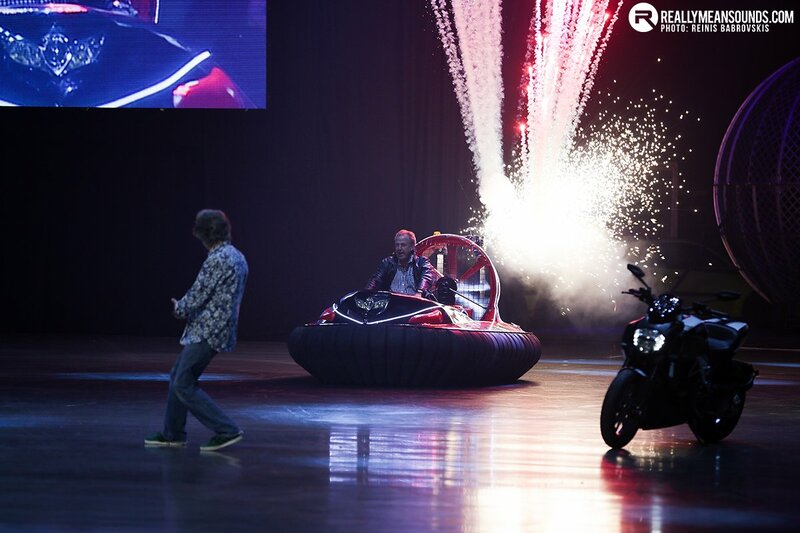 The format of the show continued alternating between the presenters on stage, recorded footage of them pretending to present a generic motoring show and the stunt driving team interspersed. Following the electric appliance race was a Mad Max style flame throwing mistress who ignited a pair of matt black donutting Porsches, creating a live dystopian fire-drift arena in front of our eyes. They had their trademark Reliant Robins out for an oval challenge, with belly laughs around the audience as the three eejits attempted to stay on script whilst upside down! A selection of supercars including the McLaren 650s, a new Nissan GTR, a La Ferrari (announced as the Ferrari, the Ferrari), a 991 911 GT3 (numbering mocked even though it was Hammond’s favourite) and the Alfa 4C on which Clarkson was gushing. There was a red 458 Specialé in attendance, of which May recently ordered the last in production just before he became unemployed. Again much ribbing from his colleagues. Following another show reel, there was a drift competition in which Clarkson drove an R33 Nissan Skyline GTS, with an impressive anti-lag system, and less impressive driving. Hammond was equally handless in an RX8. May had chosen an E36 BMW M3, four door, for the 50/50 weight distribution apparently. Both presenters and crowd were stunned after he dispatched the drift course with ease, but as usual with these three, nothing was as it seemed. There was a phenomenal display of technical wizardry in the shape of the Feeding the Fish/Liberty Walk/Momentum Motorsport LED M3s, which were built here in Northern Ireland. The arena became a Tron inspired landscape of V8 roar with co-ordinated drifting, dancing and pixel imagery on the cars and performers. We had exclusive access behind the scenes to these cars, in a feature article here. Last but certainly not least was not “Car Football”. For legal reasons at least… La Crosse allegedly! It certainly looked the same, and the jokes were flying as the red Suzuki Swifts were captained by Clarkson, Hammond and May playing for England, with three Northern Irish drivers (from the show team) in the black cars. Needless to say Northern Ireland prevailed in both shows I saw, however I would put this down as much to our driving ability as our football. No doubt this was under two hours of top notch entertainment, just like the [seldom mentioned] TV show that it grew from. So the Clarkson, Hammond and May brand is as strong as ever, and as they embark onto several live shows around the world there is no doubt they will have a Top Year. @simy Yes it looked like that and they ended up with 4 bikes in it. Was at the Sunday 12.30 show. Never been before and wasn't too sure what to expect. Thoroughly enjoyed it! Thought it was brilliant. My only complaint was that they never revved the supercars. Also thanks to RMS for tickets! Don't think I've ever won anything before, so was well pleased, awesome seats too. Was about 3 rows from the front. | Was at the Sunday 12.30 show. Never been before and wasn't too sure what to expect. Thoroughly enjoyed it! Thought it was brilliant. My only complaint was that they never revved the supercars. Also thanks to RMS for tickets! Don't think I've ever won anything before, so was well pleased, awesome seats too. Was about 3 rows from the front.